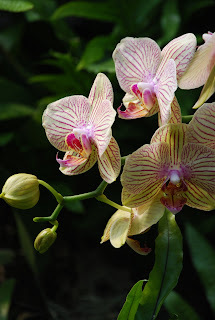 In the Charlotte area we have a terrific orchid conservatory at the Daniel Stowe Botanical Gardens (http://www.dsbg.org/ ). To complement one of their future orchid shows, this year's group challenge is "Inspired by Orchids". Each member is creating several individual pieces using orchid photos, shapes, colors, etc. as well as creating a "group challenge" piece inspired by this photo. We've set a few size / format restrictions, but otherwise the sky (or rather the creativity) is the limit! Stay tuned to see more as our challenge work evolves.